Royston Tay and Wu Wen-xiang are both 32 and multimillionaires. The National University of Singapore (NUS) graduates say that never in their wildest dreams did they imagine they would create a high-tech start-up and go on to sell it for millions of dollars. Mr Tay was an electrical engineering student when he signed up for the NUS Overseas Colleges (NOC) programme that sends students to international business hubs for a year. He thought it was a cheap way to go on a student exchange to Stanford University, as his expenses would be covered by the salary from a start-up there. Mr Wu was doing computer engineering. He thought a year of taking courses at Stanford University and working in Silicon Valley would look good on his curriculum vitae and improve his chances of landing a job in a bank after graduation. But that year in the red-hot competitive environment of Silicon Valley led to their business idea to create software which lets businesses chat online with customers via their websites in real time. "We thought it just didn't make sense that businesses were still picking up phones to complete transactions," said Mr Tay. They were on to a winning idea, but it took several more years of hard work to create the software, refine it and grow their firm Zopim, which they started in 2007, shortly after their stint in Silicon Valley. It paid off handsomely last April for them and their three co-founders when American company Zendesk acquired Zopim for nearly US$30 million (S$40.1 million). Both said their year overseas and the support of their professors were instrumental to their success. Mr Tay said unreservedly: "Without my one year overseas, there would be no Zopim." Mr Wu added: "If not for the NOC programme, I would have a boring job in a bank." Their experience contrasts with early criticism of the university's plan to ignite the entrepreneurial spark in its students. When NUS launched its plan in 2001, it held up Mr Sim Wong Hoo as the role model. But Singapore's first information technology multimillionaire whose company, Creative Technology, listed on the United States stock exchange Nasdaq in 1992, sniffed at the idea. Entrepreneurs are born, not made, he said. But NUS dons held on to the belief that if they picked students with guts and gumption and immersed them in the best entrepreneurial hubs of the world, it would work. Six colleges were set up over the next 10 years - in the United States, China, Sweden and Israel. Each had a different focus with the aim of nurturing a diverse group of entrepreneurs. The first one, set up in Silicon Valley in 2001, was targeted at those keen on high-tech start-ups. This year, NUS is setting up two colleges in Europe. With more colleges, 300 students will head overseas yearly on the programme, up from the current 200. But although the context may change, the content of the programme will remain, said Associate Professor Teo Chee Leong who oversees the NOC programme. Students will take up entrepreneurship courses in the partner universities and work full-time as interns in start-ups. Although it aims to send more students overseas, the rigorous selection process will remain. The 800 to 1,000 students who apply for the overseas colleges every year have to clear several rounds of interviews. NUS must be doing something right, say several US-based entrepreneurs, who claim they are fans of the NOC programme. Dr Himawan Gunadhi, an Indonesian-born entrepreneur based in San Francisco who acts as a consulting professor to the NOC programme, said it is impressive that more than 200 companies have been set up by NOC alumni. Several have gone on to be successes, the two most notable ones being Zopim and tenCube, a data protection service reportedly bought for more than US$10 million in 2010 by US security technology giant McAfee. Other NOC alumni start-ups to watch include Carousell, which raised US$6 million from investors led by Sequoia Capital two months ago. A more recent NOC fan is Mr James Fahn, co-founder of Fellow Robots based in Plug and Play Tech Centre, a business accelerator in Silicon Valley, just a few doors away from the NUS Enterprise office. Out of curiosity, he walked into the office one day to find out about the NUS set-up. He left wanting to hire the students. He said mechanical engineering student Daniel Tang, 23, now a key member of his team, has been impressive. Fellow Robots captured media attention recently after it put a robot in a hardware store in San Jose to greet shoppers, ask them if they need help and guide them through the store to the product. Serial entrepreneur Vijay Tella, who is on to his fourth start-up, has employed several NOC students. His last company Qik, which provided video streaming on smartphones, was acquired by Skype for more than US$100 million in 2011. 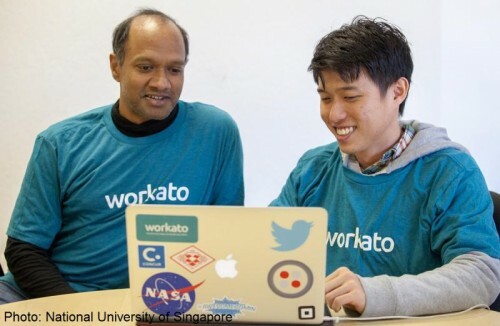 Singapore students have worked at Qik as well as at his current start-up Workato. He said: "When I started Workato, I picked some of the best elements from my earlier start-ups, including a team of Russian engineers and NOC students." He said of the students: "The most important thing in start-ups is that the team members are hungry and want to learn and grow. NUS students come with a built-in drive and hunger." Professor Tom Kosnik, who teaches a course on new venture creation to NUS students at Stanford University, said by the end of their year there, the students come up with several unique business ideas and are raring to go. NOC alumnus Varun Sivamani, one of the three co-founders of Semantics3, a thriving data analytics company in San Francisco, said NUS' support was vital to growing his idea of providing data to help businesses figure out their pricing strategies. He and his co-founders, all NOC alumni, spent a year incubating their idea in Singapore. By the end of 2012, their idea was good enough for them to be accepted into an accelerator programme run by Y Combinator, a prestigious Silicon Valley incubator. Soon after, it received US$500,000 funding from angel investors in Silicon Valley. Now his company has 150 clients and is "very profitable", said Mr Varun. He called the NOC programme "transformational". "I would have ended up as a researcher if not for the NOC," said the former Pioneer Junior College student. NUS entrepreneurship professor Wong Poh Kam said one measure of the effectiveness of the programme is that 7 to 9 per cent of NOC alumni go on to try setting up a business, whereas only 1 to 2 per cent of other NUS students do so. He said one must also consider those who go out to work in other start-ups or in the wider job market. Over the years, several management consultancies and government agencies, such as the Economic Development Board, have hired several NOC alumni. "Not everyone will go on to be an entrepreneur. But the programme would have met its objective if everyone thinks and acts like an entrepreneur," said Prof Wong. Dr Lily Chan, chief executive officer of NUS Enterprise, the unit which oversees all programmes to nurture entrepreneurship, said the university is convinced the NOC programme can help driven and passionate young people. "Students may go on the NOC wanting to beef up their CV to work in a bank, but they come back changed - bubbling with ideas and wanting to do their own thing. Never mind the job in a bank or MNC (multinational corporation)."